Five Marbles Craft Beer Restaurant at Rendezvous Hotel has two USPs. Usually food is the focus, so most of the time, chefs come up with food menu first before scouting for beverages to complement it. But at 5 Marbles, beers come first and then the menu is created to accompany the beer. This is difficult because it means the chef is working within constraints and has to be creative at the same time. Furthermore, they have a rotating selection of 12 craft taps, with craft beers from Singapore, Japan and the UK, as well as ciders and meads. 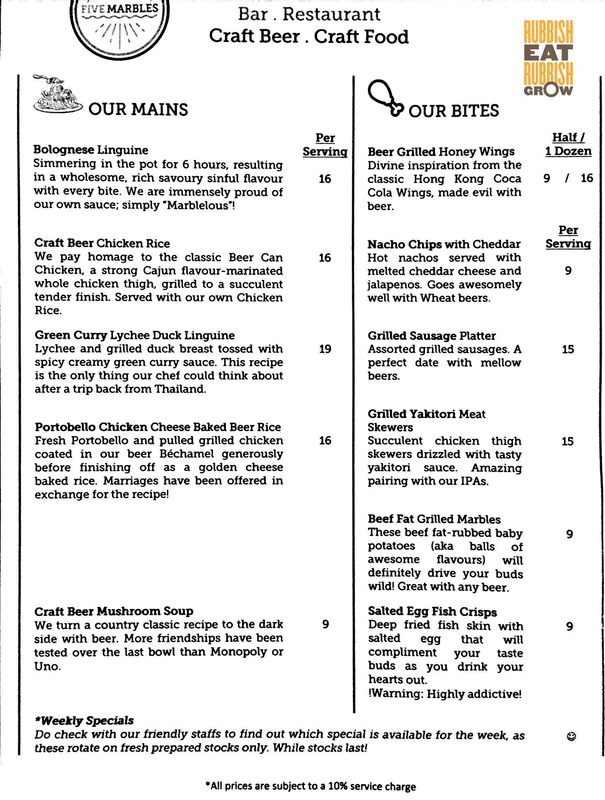 That means the food menu is constantly changing to suit the beers. Second USP: it is extremely affordable at a town location: half pint starts from $5 (which means you can try a few different beers) and the mains start from $16. I feel like I should talk a bit more on the beer first before moving on to the food because they are excellent. Mr. Fitness who is allergic to alcohol–the skin on his fingers peels the next day of drinking–was fine after drinking here probably because craft beers usually don’t contain preservatives in commercial beer to extend shelf life. The beers here include pale ale, double IPA, porter, stout, cider, and mead. 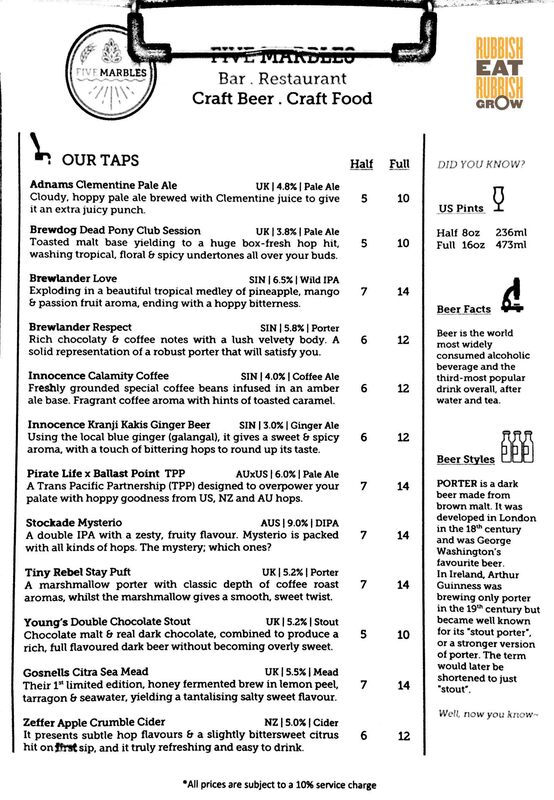 Brewlander (the one that celebrities Allen Wu and Daniel Ong invested in) is sold here and they are delicious. In fact, Mr Fitness’s favorite beer of the night is Brewlander Courage, a hoppy double IPA with notes of citrus and pine. I prefer a lighter and more balanced beer and recommend the Adnams clementine pale ale ($5 half/$10 full). But really, any beer here is good. Finally, the food. Most of the food is made from scratch and they don’t use process food. Sometimes the chef goes to the wet market at 4am or Jurong fishery port to get fresh ingredients. It’s really a tiny menu with only 4 mains but there is enough variety for everyone and there is much heart and effort going into the dishes. Starters: We started with craft beer mushroom soup ($9), made from 4 different mushrooms including portobello, white button, and shiitake. Pale ale or lager is infused in it, depending on which craft beer goes better. You can really taste the integrity of the soup from the thickness and graininess. The beer grilled honey wings ($9/$16) are tender, sweet and redolent of rosemary. The pork belly confit is cooked for 6 to 8 hours, then seared on the surface, and doused in a maple-peanut sauce to complement a maple beer. The texture is great, melts in the mouth with a bit of crispiness, but the peanut is overwhelming. (The chef said that there is only a little peanut but the maple syrup enhances it.) I’d prefer if the peanut is just a lingering aftertaste, not as a forceful frontrunner. Mains: inspired by Thai food, the green curry lychee duck linguine ($19) is extremely, extremely spicy. We couldn’t take it after a bite and when food gets this spicy, you can’t really taste the intricacies of ingredients. But apparently, this is their bestseller and we saw some ladies digging in with much gusto. I personally won’t recommend it, but if you’re a fire-eater, go for it. The other linguine, bolognese linguine ($16), has stewed its fresh ingredients for 4 to 6 hours with two types of red wine (Shiraz and I didn’t catch the other). It’s okay. It’s clean but I’d prefer it to have a heavier, wetter tomato base. Our favorite dish, cheese baked beer rice ($16), uses homemade beer Bechamel sauce and underneath the blanket of cheese lies chucks of fresh portobello which gives a musky umami to it. There is also a slight tinge of curry to give it edge. Inspired by Hainanese chicken rice, the craft beer chicken rice ($16) pairs a Cajun-flavored chicken thigh with our local chicken rice. The chef explains he didn’t want a heavy rice to overpower the chicken so the rice has only a light flavor. Sound logical to me but a stickler may probably disdain it. We ended the meal with beer floats which are really fun and taste. 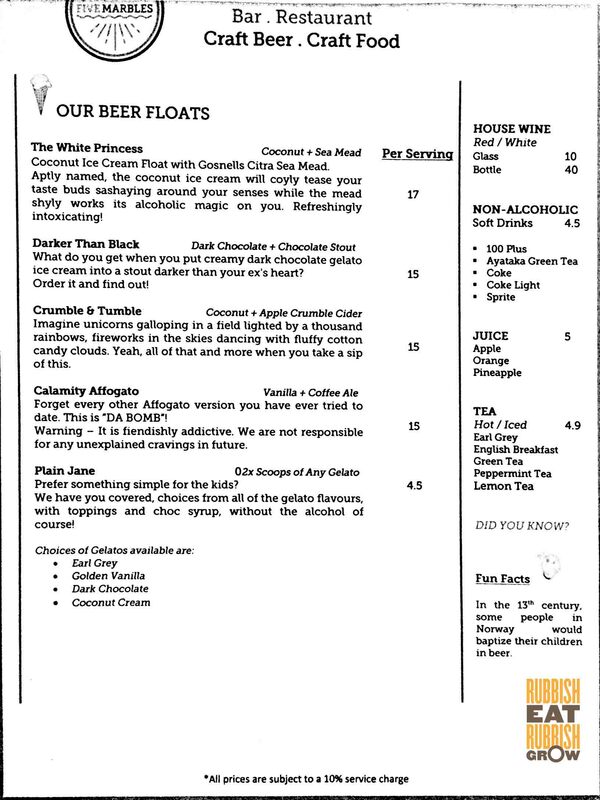 We tried the two bestsellers, white princess ($17, coconut ice cream and mead) and darker than black ($15, dark chocolate gelato and chocolate stout). The latter ranks higher on the happiness index for us, stronger, bolder, but the former sells better. When restaurants say their food has beer (like beer battered fish and chips), you can’t really taste the beer but at Five Marbles, the taste of beer in the food comes through. Furthermore, the food is quite original. And given the pricing, this is a place I’d come with friends or before a movie at Cathay. My only grouse is no air-con!